Pro Charging Systems is a leading provider of a wide range of battery charging systems for marine, industrial, emergency services and recreational applications. Their charging systems are built to last and designed to make your battery systems perform better and remain in service longer. Pro Charging systems charge batteries faster to 100% charge with no risk of overcharging, maintain the charge and make batteries perform better and last longer. As a result, leading battery manufacturers recommend these products to charge their batteries and many manufacturers make Pro Charging System chargers their primary choice for installation on their products. Pro Charging battery maintenance tools include the battery system balancer and discharger. When used together, the Battery Discharger and Battery Balancer can be used to sort and regroup like batteries to eliminate unbalanced batteries in a bank, thus extending the lifetime of batteries. Pro Charging Systems battery chargers are known as the safest, most reliable, and best performing battery chargers in the industry. Across a broad range of fishing and recreational boats, Pro Charging Systems keeps boaters on the water longer while extending the life of their batteries. Eagle Performance Series chargers by Dual Pro are specially designed for use with electric vehicles such as golf carts and lifts. 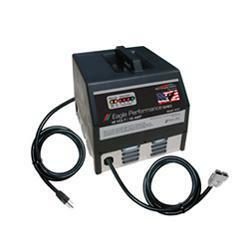 Fully automatic and water resistant with optional manufacturer specific connectors, Eagle Perfomance chargers offer unmatched performance, reliability, safety and quality. Bil-Jax Boom Lift battery chargers by Pro Charging Systems are direct fit replacements for standard OEM chargers. Pro Charging Systems battery chargers are designed and manufactured in the USA and fitted with the correct connectors and cables for "plug and play" installation on your Bil-Jax lift. Genie Scissor Lift and Aerial Work Platform battery chargers by Pro Charging Systems are fast becoming an industry standard to replace OEM chargers for Genie equipment. Pro Charging Systems battery chargers are designed and manufactured in the USA and fitted with the correct connectors and cables for your Genie lift. JLG Lift battery chargers by Pro Charging Systems are designed and manufactured in the USA to replace OEM chargers for JLG equipment. Fitted with application specific connectors and cables for your JLG lift, these systems meet or exceed OEM spec and are "plug 'n play" for easy installation.